Rtapalli Vidyapitha, a free residential high school situated in Guabari, Balipatana, Khordha. 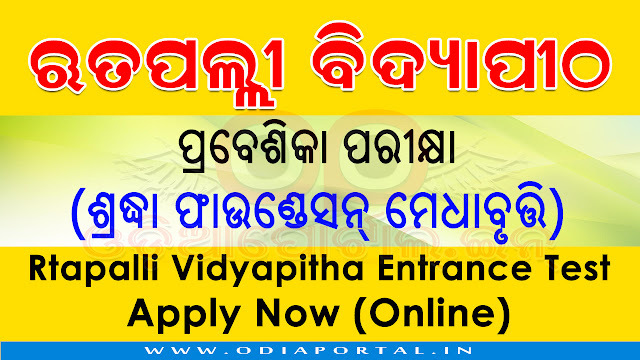 Rtapalli Vidyapitha invites applications from Class V students for admission into Class VI. Selected candidates will study in this residential school from Class VI to X without any cost of education and living. All expenses are taken care of by the Shraddha Foundation Trust through this scholarship. The Class X examination will be under the BSE, Odisha. About 15 students are admitted to Class VI each year from all over Odisha through a two-phase entrance test. Students from low-income families and rural areas as well as girl students are given preference for half of the seats. Keeping in focus the philosophy of Shraddha, Toshali and Rtapalli Founders that all children are equal, the other half of seats are need-blind and filled on merit. In Phase-I examination students are tested in mathematics and English. Selected students are invited on a later date to stay overnight at Rtapalli for the Phase II test. Parents/guardians drop the students at Rtapalli and pick them up next day. During this stay students are taught new topics in mathematics and tested on it in addition to a test in standard math and English. Students get an opportunity to showcase their extra-curricular activities in the evening. Students from English-medium schools will have their entrance math questions in English. Click on apply button below. There are 22 steps in the online form. Fill each and every blank boxes with correct data. Print or Download your admit card for future us. Please attach a photograph to the admit card and bring it to the examination centre. Bring a copy of your Aadhaar card for identity verification. Bring one more passport size photograph for submission at examination centre.